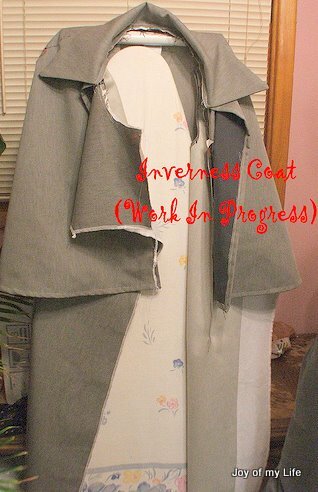 The Inverness, a Highland overcoat with a capelet, is a good example of form following function. 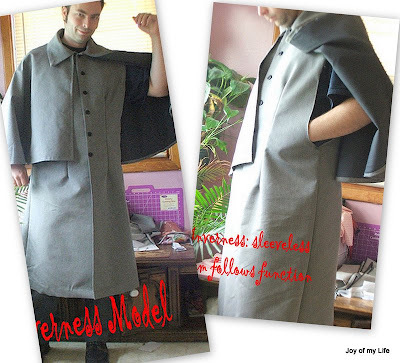 The coat is sleeveless with a largish armhole to allow access to sporran, pockets and other items on person without unbuttoning the overcoat. It has a nice capelet to compensate for lack of sleeves. The Inverness being a practical overcoat, I was interested in making one for D, but didn't quite know where to start. That's where Butterick 3993 pattern came in handy, although we had to make some adjustments to the pattern. The pattern instructs how to sew sleeves on, but, since that is not quite close to the true Inverness overcoat, I didn't attach the sleeves; also, i sort of made the armhole bigger by measuring out what it needs to be so D can access his wallet and keys in his pants pocket, through the armhole, without having to unbotton the overcoat. Since this was my first one and an experimental one, I think I learnt a few things. I am looking forward to making another one, perhaps in a slightly heavier fabric and try out a few more features I have in mind, like: buttons to hold the cape down in the front so on a windy day it is not billowing about; perhaps instead of largish armholes, I want to try slits on the sides that sort of appear like a mock-pocket except, it just allows access to the pants-pocket... we'll see. The other day, all of a sudden, it started pouring when D was walking home holding the baby, and the capelet came in very handy to tuck her under it and keep her from getting drenched. When I got the Butterick pattern, it seemed like such a daunting task. But, with D's help in measuring to fit, and interpreting some of the pattern instructions, it turned out to be a fun project for the Thanksgiving break! Hi I am a director and I am hoping to remake a movie from 1927 called london after midnight starring lon chaney and one of the characters is a vampire and wears an interverness coat and im looking for sewing instructions is there any way you could tell me??? Zak, Anonymous: Sorry, I don't have any other suggestions - I found my pattern on e-Bby after quite a rigorous search and wait.